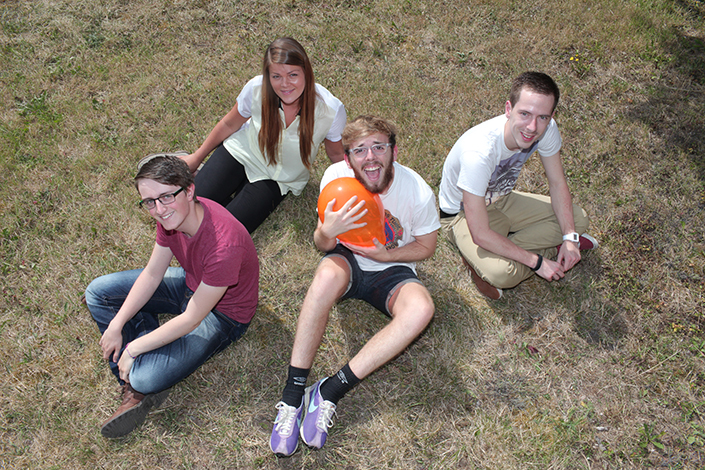 This month we welcomed four new members to Team Sparkol. These happy faces will be making VideoScribe even bigger and better over the next year. In traditional fashion, we interviewed them to find out what their secret skills are, what they're bringing to the team – and why you should never steal chocolate. What did you do before you came to Sparkol? I'm here for a year and then I'll go back to uni to do the final year of my Computing and Game Development degree. I've worked on a ton of different game ideas and produced some nice software at university and in my spare time. I've played the drums since I was about 10 and I also do both live and studio sound engineering in my spare time. I can also ice skate pretty well. What are you going to be doing while you're here? I'll be mashing my magic keyboard, helping to bring new features into VideoScribe, improve current systems and swatting pesky bugs! I'll also be helping with new projects. What's been the best bit so far? My ideas and knowledge are valued and used which is really important for a software engineer. I'm also loving the free food. I feel like it would be difficult to code with long fingers, and I don't need my legs to play computer games – so I'll have to go with legs as long as my fingers. What did you do before joining Sparkol? I just finished my second year doing Computing and Games development at Plymouth University. What's your breakfast of choice to get you ready for coding? A couple of cups of coffee and anything I find in the kitchen. Hopefully leftover pizza. I'm joining the development team, so I'll be helping the existing team to develop more exciting and intricate products. The food! But the people really make it the best place to be. If you could be invisible for the day what would you do? I would do what every invisible person does – hide the TV remote. What did you do before joining the Sparkol team? This is my first full time job, but besides university I have been a lifeguard, a barmaid and a barista in a coffee shop. What’s do you like to do in your free time? I'm interested in sport, particularly hockey, which I have been playing since I was about twelve years old. I like the outdoors, being out with my dogs on long walks, and socialising with friends. I aim to support the work that the marketing team does but I'll also be heading up some of my own marketing campaigns, testing some of my own theories and ideas for the company. I'd probably be a dolphin (lame!) because they get to explore things and do dives and tricks. I love the water and swimming. Welcome back Matt! You did an internship with us last year – what are you bringing to Sparkol this summer? Better graphic design and illustration skills! What's changed since you were here last? Sparkol has grown fairly rapidly from when I first started and VideoScribe has really evolved function-wise. Everything is basically bigger. You're trapped on a desert island. Why are you there? I stole a creme egg once. I was running for years but was eventually apprehended and sent away. Everyone knows you shouldn't mess with Cadburys.